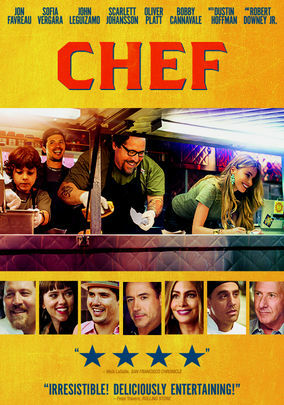 Chef is a 2014 dramedy film written, directed, produced, and starring Jon Favreau. Favreau plays Carl Casper, a successful celebrity chef who has become stuck in a rut, cooking the same dishes over and over again. After a bad review from a notable critic, Casper goes on a rant that gets uploaded to the internet and goes viral. Casper ends up quitting his restaurant and gets his own food truck at the behest of his ex-wife, Inez (played by Sofía Vergara). Casper and his young son start to bond while fixing up the truck. Casper’s love for cooking returns and the relationship with his son becomes stronger and stronger. Casper’s food is a hit with customers and critics alike, and the film concludes with Casper opening a new successful restaurant and remarrying his ex-wife. Sorry, spoiler alert. I always forget to mention the spoiler alert. Chef is an enjoyable movie. It was a passion project of Favreau and you can tell. I have a few complaints though. For starters, it’s too long. It takes about forty-five minutes for him to even get the truck. We didn’t need that much exposition. It shouldn’t take that long to establish that he’s a great cook and a lousy family man. And the film seems to be a commercial for Twitter, Vine, and other forms of social media. I thought I was watching a movie about food, not technology. The supporting cast is great, although somewhat underused. Robert Downey, Jr., Scarlett Johansson, Oliver Platt, Dustin Hoffman, and John Leguizamo all play supporting roles. John Leguizamo’s character, Martin, is there in the beginning, disappears for a while, and suddenly comes out of nowhere halfway through the film to work with Casper in his truck for no money and no reason other than to give Casper more time to bond with his son. Martin seemingly does all of the prep work and does most of the cooking during the food truck scenes. He’s more of a chef than the titular chef. Watching this film makes you hungry. Be forewarned. Make sure you have something to snack on because your stomach will be grumbling every five minutes. It’s a good movie, a little redundant at times, but still solid entertainment. I watched it on Netflix. You can too. Really dug this review for Chef! I am going to watch it on Netflix now because of it. cheers man!